Regent Antiques was established in 1980. Born out of a natural love for art and beautiful objects, we have been a highly respected member of the antique fraternity ever since. Industry bodies of which we are a member include LAPADA and CINOA. Over the decades our business has gradually evolved from being one of the leading wholesalers to some of Continental Europe’s finest dealers to our current focus of having a substantial online presence as well as a passion for dealing with individual and corporate clients on a bespoke basis. We have been featured in countless publications as well as a number of high profile television programs such as the BBC’s famed Celebrity Antiques Roadshow and 60 Minute Makeover. Our mission is to provide an enjoyable and seamless buying experience that delivers the finest pieces to all corners of the globe so that they can be cherished for generations to come. The founder of our business is Tino Quaradeghini. He is multilingual and has built up an extensive knowledge of every aspect of the antiques trade over many decades. 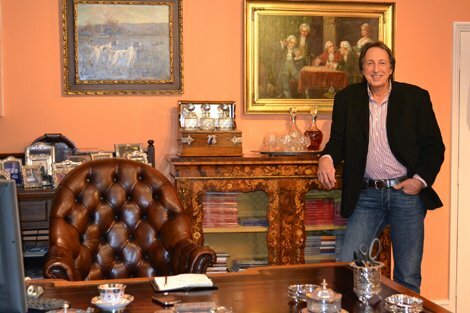 Tino's passion for antiques takes him all over Europe in search of rare and beautiful furniture and decorative objects. Each piece is chosen with the greatest of care and attention to detail, and our clients include many high profile businesses and individuals from every corner of the world.